holidays near the end of each year. The Christmas wars, a.k.a. "December Dilemma"
or all of the above, plus many more as seen by followers of other religions? We welcome those visitors who arrived here after seeking JustSayHappyHolidays.com, SayMerryChristmas.org, or SayHappyHolidays.org. These three URLs are forwarded to this menu within the ReligiousTolerance.org web site. ReligiousTolerance.org is a religious web site with a difference. Rather than promoting a particular religion or denomination, we promote religious tolerance, coexistence, cooperation and respect. We have been online for almost 21 years. We have over 7,500 essays and menus covering all aspects of religion. Customer 1 (loudly): "I'm not a Christian!" Customer 2 (loudly)" "Christmas hater!" Customer 3, who is next in line: "Wow. Some people are so cold." Copying the theme found in Sesame Street: this section of our web site is brought to you by the letter "S."
"Happy Holidays." This indicates that there are many celebrations, both secular and religious, at this time of year that are worth observing. The hot button item that causes so much conflict at this time of year is the letter "s" at the end of "Happy Holidays:" It poses the question: Is there one holiday or are there multiple holidays in December that should be acknowledged? A multi-faith country composed of Christians, Jews, Muslims, Buddhists, Hindus, Wiccans, other Neopagans, followers of the Flying Spaghetti Monster, adherents of other religions, and the NOTAs (sometimes called the NONES). The latter are persons NOT Affiliated with any organized religion -- including Agnostics, Atheists, Secular Humanists, freethinkers, secularists, skeptics, the religiously disinterested, etc. The religious makeup of the U.S. is in a state of flux. The percentage of NOTAs and adherents of non-Christian religions is increasing. The percentage of Christians is in a slow downward spiral, largely because teens are leaving the faith in which they were raised and never returning. Many conservative Christian groups are promoting Christmas-only greetings. A few years ago, some fundamentalist Christian groups gave up attempts at reason and persuasion. They started resorting to economic boycotts to force unwilling stores to meet their goals. However, they seem to have largely abandoned such strong-arm tactics and reverted to merely making list of which retailers are acknowledging diversity -- as in the sign below -- or are adopting a Christmas-only policy. Liberty Counsel has its Friend or Foe Christmas Campaign; The American Family Association (AFA) has its "Naughty or Nice" list. This is a lose-lose situation for U.S. retailers who, above all, do not wish to make their customers angry. No matter what phrase is used, the store is going to alienate some customers. The conflict appears to have reached a peak in the middle of the 2000's and is has been fading in recent years. By 2015, it had shrunk to a debate about the information on the side of a Starbucks seasonal coffee cup. 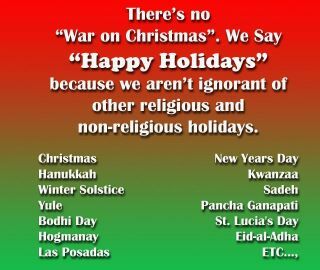 Overview of the "Christmas wars"
The nature of, causes of, and reaction to the "Christmas wars"
A more detailed introduction to the "wars"
What do the public and stores feel about the "wars?" The Christmas office party: an urban legend"
Part 1: Religious and secular celebrations. Part 2: Conflicts & changes in terminology. Two individuals' personal comments. Part 3: More detailed information about religious celebrations near Christmas time. Some annual secular observances. Part 4: Festivus: a celebration "for the rest of us"
What is the original "reason for the season"
An essay donated by Susan Humphreys: "Christmas: What is the 'reason for the Season'?" Muslim holy days are based on a lunar calendar. Thus, they are observed about 12 days earlier with each passing year. A dozen or so years ago, when the decorated evergreen tree was added to this menu, Ashura was celebrated in mid-December according to the Gregorian calendar. In 2015, it was observed in June. Circa 2030 it will be in December again.